This time last week, I, together with my training buddies Sara & Lian, went on an all out girls-last-summer-hurrah staycation in Solaire Resort and got spoiled rotten. Lian and I came from a 30km bike ride in Nuvali so getting picked up by the hotel’s Benz (with back massaging seats) was surely a treat. The service from when we stepped foot into the car up until we were dropped off back home was impeccable. Upon arriving the hotel, we were greeted by staff and were immediately ushered to our rooms. Despite having two rooms (and three beds), the girls and I decided that we wanted to stay together in the suite since it was big enough to accommodate a family anyway. First up on our itinerary was lunch in one of their signature restos, Red Lantern. As I mentioned, since Lian and I came from training and Sara had just arrived straight from work, we were famished. We consulted with our server which ones were the best sellers and ordered them. The seafood that we had felt like butter in our tongue as it melted in our mouths. That’s how fresh they were. 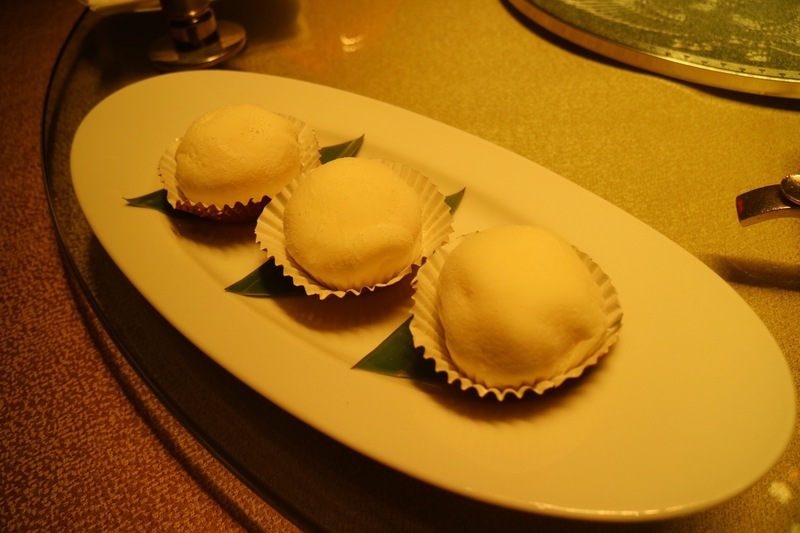 We also had the honor of meeting the resto’s Chef, whom we commended non-stop for his sumptuous food and he then made us tey his special mochi dessert right after. Creamy goodness. Yum. Now as if we haven’t eaten enough, the girls and I walked over to Patiserrie where we had more sweets and some coffee. They had a vast selection of pastries, gelato and other desserts that we had a hard time choosing what we wanted. We ended up with 3 mini cakes and our choice of caffeine. Coming back to our suite, you could see the pool from our window and we thought that it was too beautiful a day to stay indoors so off to the pool area we went to spend the rest of the afternoon for some R&R in our cabana. Looooved the hot tub. Our muscles were thanking us for that. We just spent the whole day bonding with each other. It’s different when you’re all in training or racing (or shooting). Having a more relaxed set up gave us girls the chance to get to know each other more outside of sports. Something must be wrong with our bellies as when the clock struck 8, we were all once again hungry. We already had reservations in another Solaire signature restaurant, Finestra, and dining there was quite an experience. Our server, Earwin, was the best. He was chatty without being overly so, was knowledgeable of everything we asked of, even when Sara & Lian asked him what size of steak seemed a suitable order for them. Our lobster salad was beyond amazing, my seabass order was incredible and Lian & Sara’s steaks were (as I’ve been told) ridiculously perfect. With happy bellies, we went to dreamland, but only to escape at 4am to do a race back in BGC. A weekend wouldn’t be complete without a run for us three anyway. (Had we not raced, we would probably be spotted in the hotel gym still doing our thing. That 10km race surely worked up our appetite. We decided to just order in and wait for our spread whilst we rested and freshened up. Sara and I got the “healthy lifestyle” breakfast option while Lian chose the Chinese breakfast. We also had detoxifying juices on the side. The spread looked like it could feed a family of 10 but 3 hungry girls wiped out all the plates. Now, you wouldn’t have a weekend of R&R without a trip to the spa right? What with our full training schedules most of the time during the week, this 2-hour “For Her” spa treatment — a 30 min body scrub, 45 min massage, 45 min facial — was exactly what our bodies needed. Least to say we all fell fast asleep right when the treatment began. We capped off our Staycation with more food — late lunch and afternoon tea at Oasis garden cafe. After ordering our sandwiches, and afternoon tea Filipino special (with Turon, bibingka and whatnot), I realized that I had left my Cartier bracelet inside the spa locker. 5 mins later, someone from the Solaire staff personally brought it back to me in the resto. Their 10/10 service rating for me just went up a notch, if that were still possible at this point. The weekend was nothing short of perfect. It had the perfect balance of food and activities; rest, relaxation & racing. From their service, staff, food — everything about Solaire was solid. To say that I loved my stay there is an understatement. They surely know how to treat you like a princess. Although I think my friends and I were treated more like queens, more than anything else. Thank you , Solaire for that wonderful, unforgettable weekend. I can’t wait to do it again!